Today (December 16) is certainly turning out to be a good one for fans of 1960s pop stars. Not only did the Beach Boys officially announce their 50th reunion, but Beatles legend Paul McCartney just rolled out plans for his next solo album. Entitled My Valentine, it's reportedly set to come out February 7 via Concord/Hear Music. 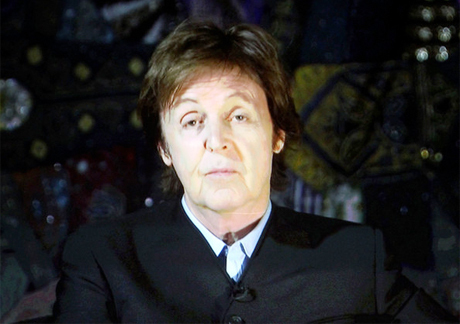 The album apparently finds McCartney delving into the jazzy music hall style that has long been a favourite of his. He said in an interview on French radio [via Direct Current], "This will sound like the years between 1920-1940, the time when my father was 20. These are songs I heard. My family, my uncles, everybody sang. And there will be pieces I wrote, but in this style." In other words, there will be a mix of classics and original material. We're imagining a lot of songs that sound like "When I'm Sixty-Four." McCartney continued, "I worked with Diana Krall, and great jazz musicians like John Clayton. This is an album very tender, very intimate. This is an album you listen to at home after work, with a glass of wine or a cup of tea." The disc was helmed by jazz producer Tommy Lipuma, who has previously worked with the likes of Miles Davis, Barbra Streisand and more. We're guessing that this is the album of pop standards that McCartney began talking about back in the spring. Now, what about that "heavy rock album" he promised us?